I really do not know how to put a title to this. However, I wish to put up the photos of these two poor animals which were slaughtered and grilled. Yummy….. There was an alumni dinner consisting of 250 people and they requested for a whole grilled lamb. 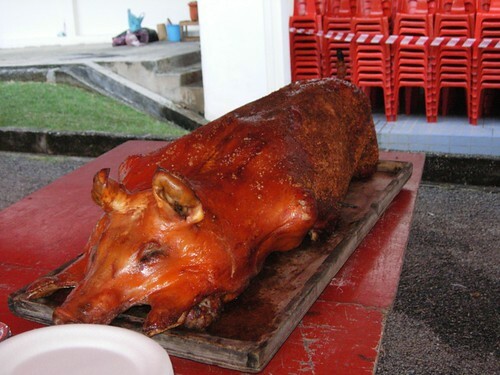 Then, another roasted pig was thrown in as roasted pork goes perfectly with liquor. So, on that night, I pig out on roasted pig and grilled lamb. Notice how they chopped off the head of the lamb but not so for roasted pig? I wonder why? Maybe pig is awfully cute even when roasted but maybe lamb looks gory? The dinner was catered from Tauree (I am not promoting so you got to find their contact if you wish to hire them) and overall, it is not bad. We had hawker stalls with char koay teow, laksa, pasembur, mee mamak, ice kacang and lots more. Per head was RM18 but it is not inclusive of the roasted lamb. The lamb is about RM600+. 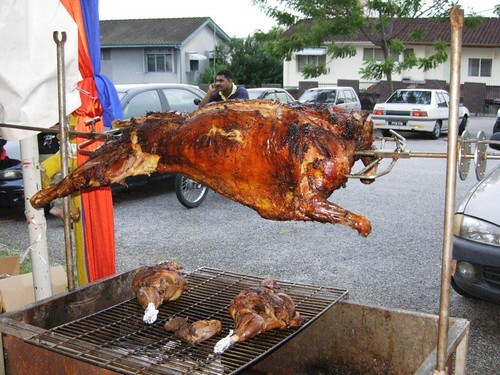 RM18 per head is cheap… really wan to have a bite on the lamb.. hee hee..
ask u..where place buy roast lamb? jannie – I think the lamb is supplied by the caterer. Usually the bigger catering companies only can provide roast lamb because they need the skill to roast it. I am not sure which caterer they got.